WBA ‘regular’ welterweight champion Manny Pacquiao 61-7-2 (39) is still chasing a rematch with the retired Floyd Mayweather Jr 50-0 (27) after delivering a comprehensive 12-round points win over Adrien ‘The Problem’ Broner 33-4-1 (24) at the MGM Grand in Las Vegas, Nevada on Saturday night. 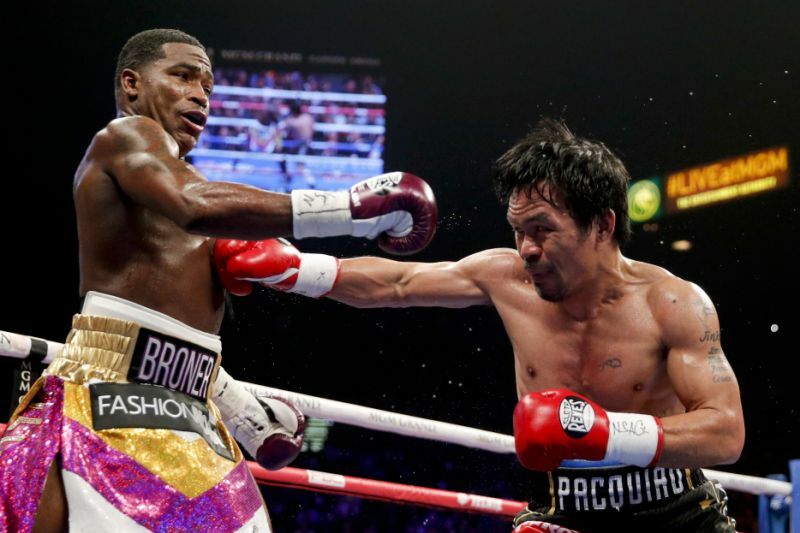 The 40-year-old Filipino southpaw boxed a composed fight to claim a comfortable unanimous points decision victory over Broner by scores of 116-112, 117-111 and 116-112. It was Pacquiao’s first fight since claiming the secondary WBA title against Argentinean banger Lucas Matthysse in Kuala Lumpur, Malaysia last July. “I proved in my last fight against Matthysse and now I proved it again: The Manny Pacquiao journey will still continue,” Pacquiao said. Although he claimed before the fight that he would be going for the knockout, Pacquiao later said it was his team who asked him to hold back to avoid making any mistakes. Broner, 29, of Cincinnati, tried to claim a moral victory of sorts after the fight. “I beat him. Everybody out there knows I beat him. I controlled the fight, he was missing. I hit him clean more times. I beat him …I did this for the hood,” Broner said. According to punch statistics, Pacquiao landed 112 of 568 punches to Broner’s 50 connects from his 295 attempts. Broner hasn’t won a fight in almost two years and is 3-3-1 in his past seven outings. After the fight Pacquiao had a message for a conspicuous member of the 13,000-strong crowd. Asked about the rematch during the Showtime broadcast, Mayweather was noncommittal.